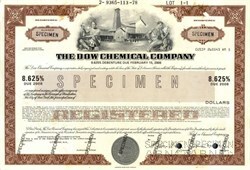 Beautifully engraved specimen certificate from the Dow Chemical Company printed in 1978. This historic document was printed by the American Banknote Company and has an ornate border around it with a vignette of two allegorical men in front of an early company facility. This item has the printed signatures of the Company's officers. Light residue on front. The Dow Chemical Company, commonly referred to as Dow, is an American multinational chemical corporation headquartered in Midland, Michigan, United States. As of 2007, it is the second-largest chemical manufacturer in the world by revenue (after BASF) and as of February 2009, the third-largest chemical company in the world by market capitalization (after BASF and DuPont). Dow manufactures plastics, chemicals, and agricultural products. With a presence in about 160 countries, it employs about 54,000 people worldwide. Its stated mission, under the current CEO, Andrew N. Liveris, is: "To passionately innovate what is essential to human progress by providing sustainable solutions to our customers" with the vision: "To be the most profitable and respected science-driven chemical company in the world", and the values: �Integrity, Respect for People, and Protecting our Planet�. Annual R&D spending exceeds $1 billion. The company has seven different major operating segments, with a wide variety of products made by each one. Dow's 2012 sales totaled approximately $57 billion. Dow has been called the "chemical companies' chemical company" in that most of its sales are to other industries rather than end-users. Dow sells directly to end-users primarily in the human and animal health and consumer products markets. Dow is a member of the American Chemistry Council.